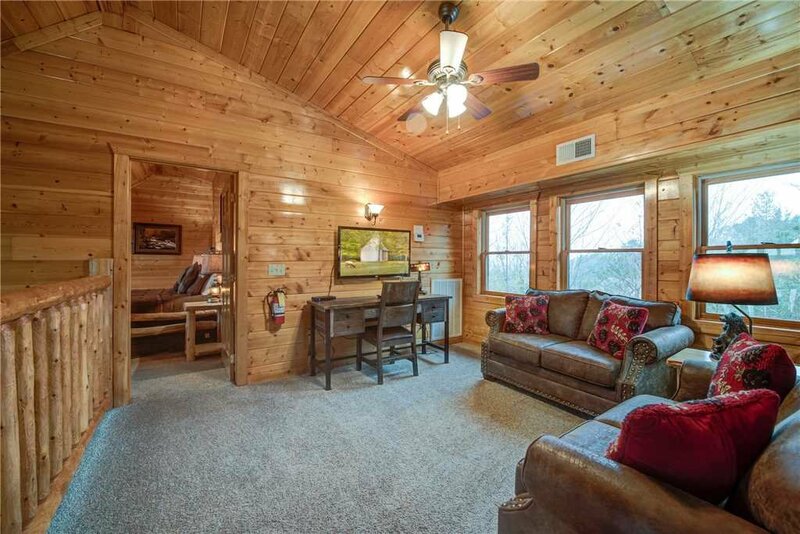 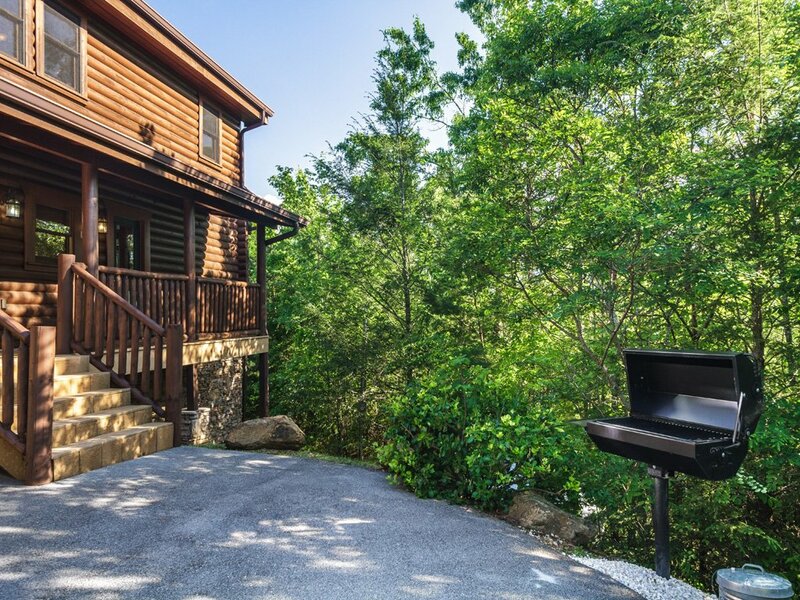 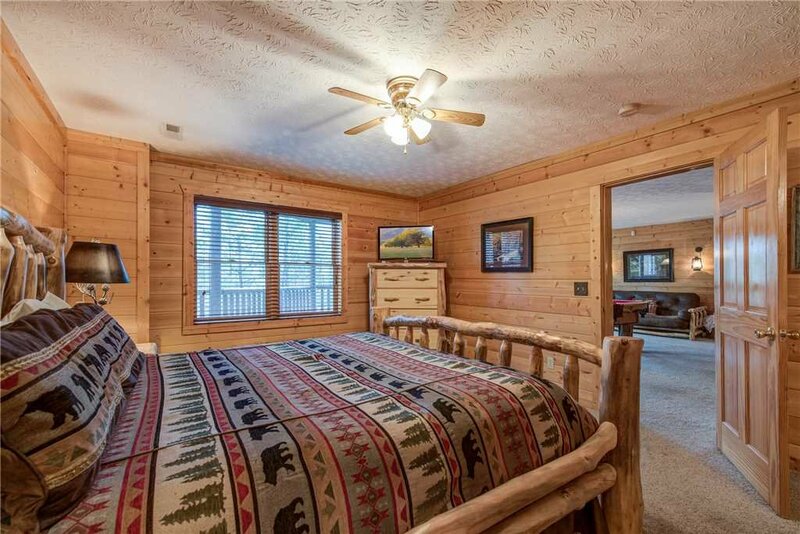 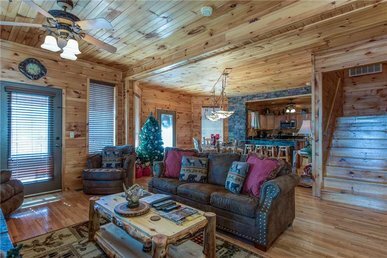 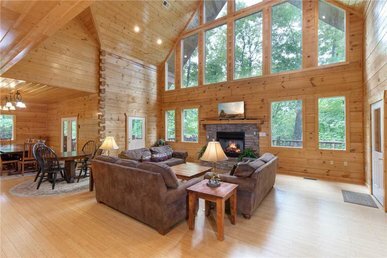 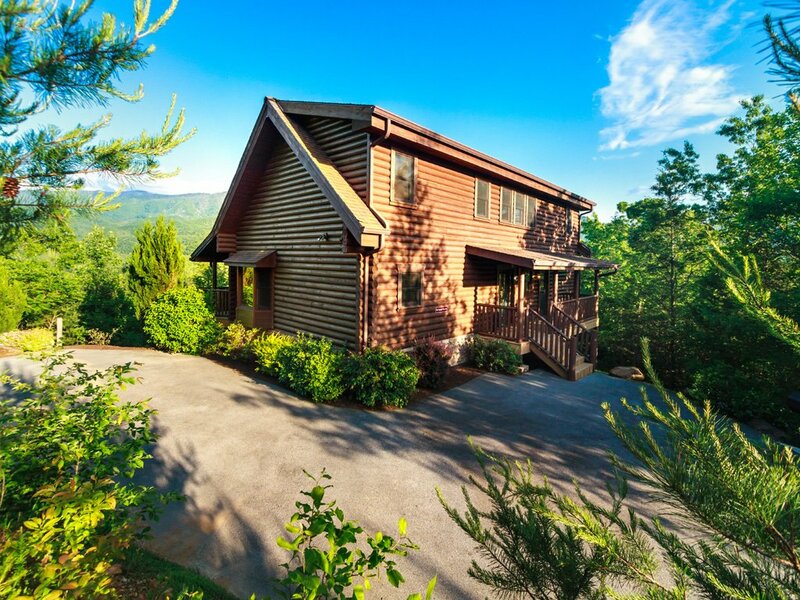 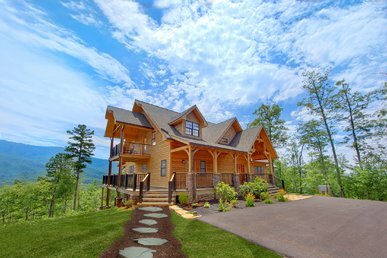 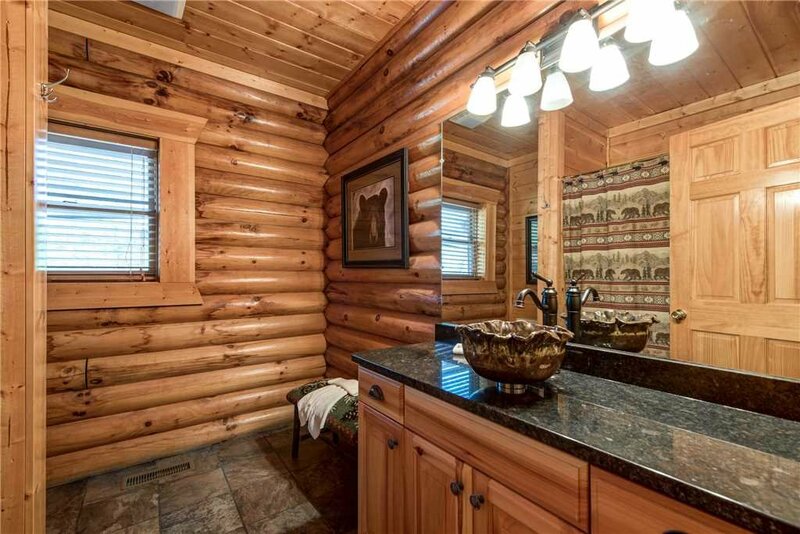 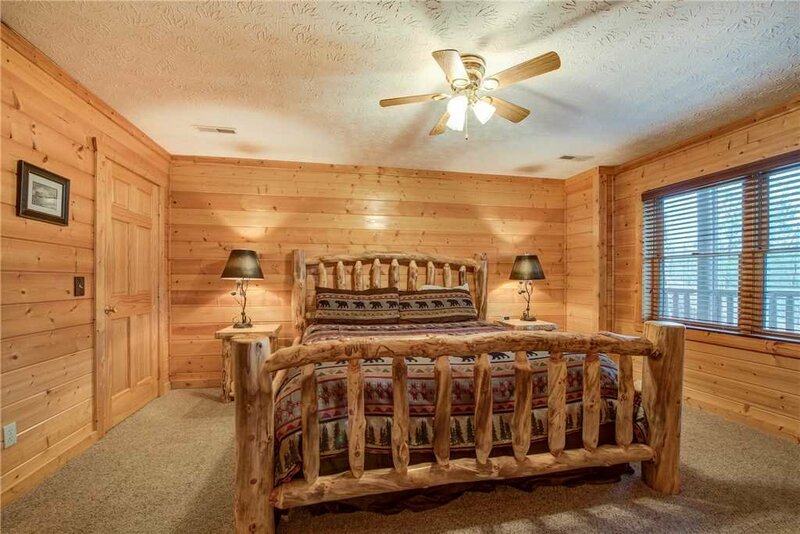 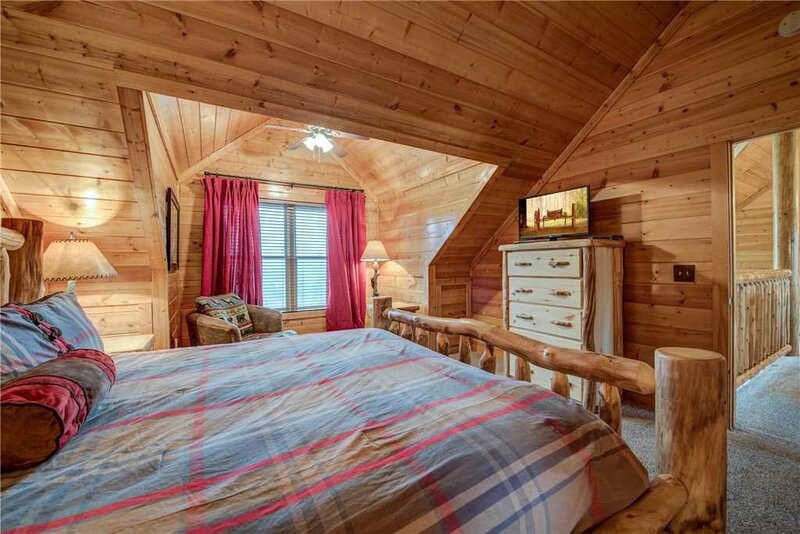 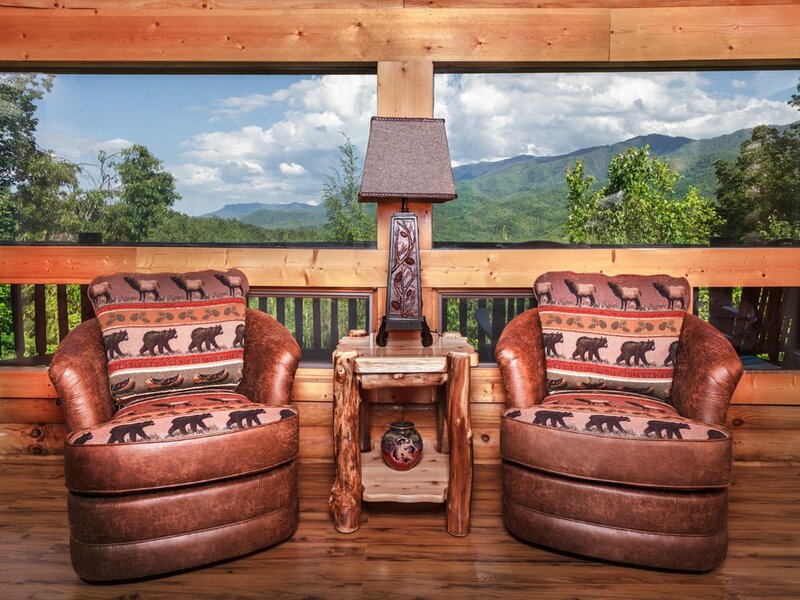 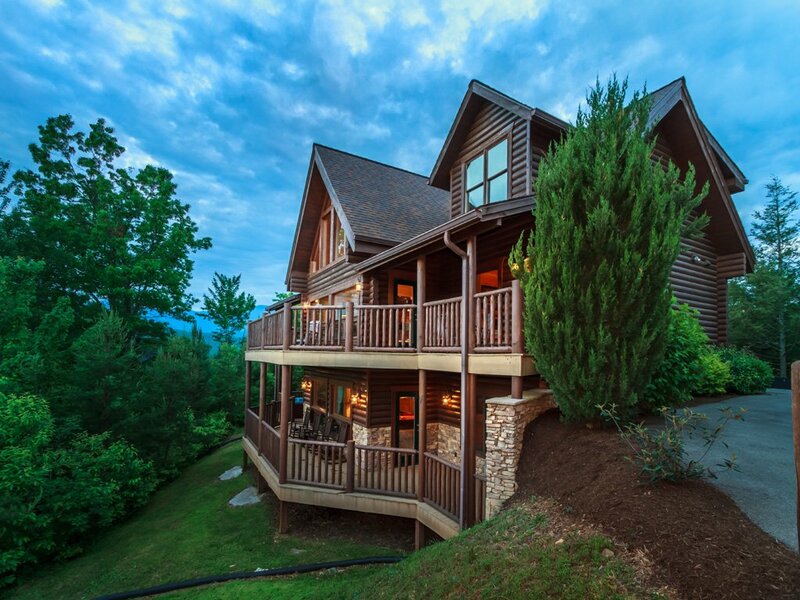 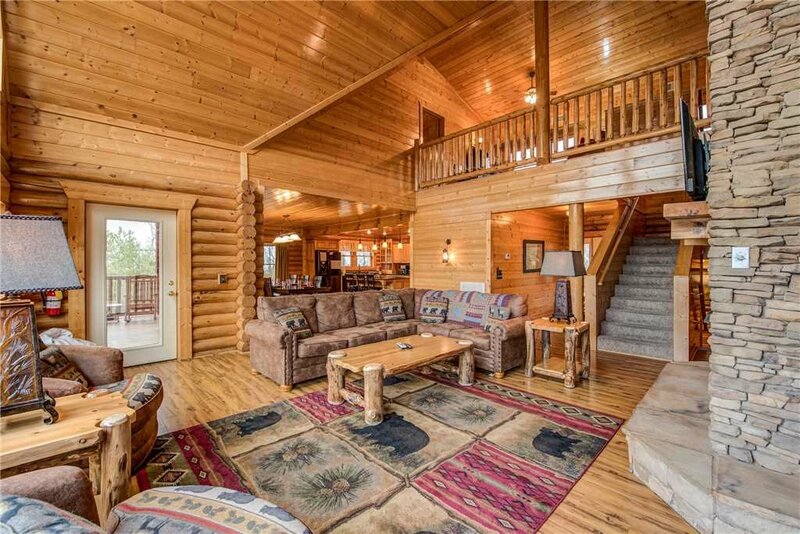 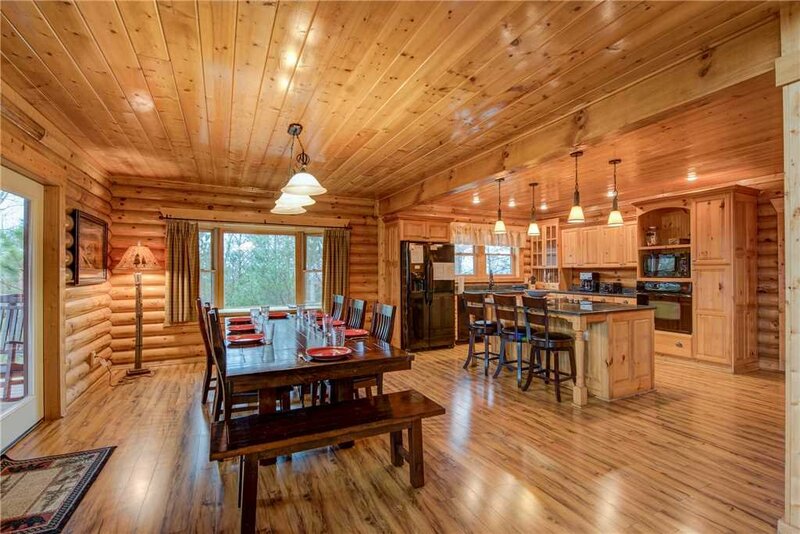 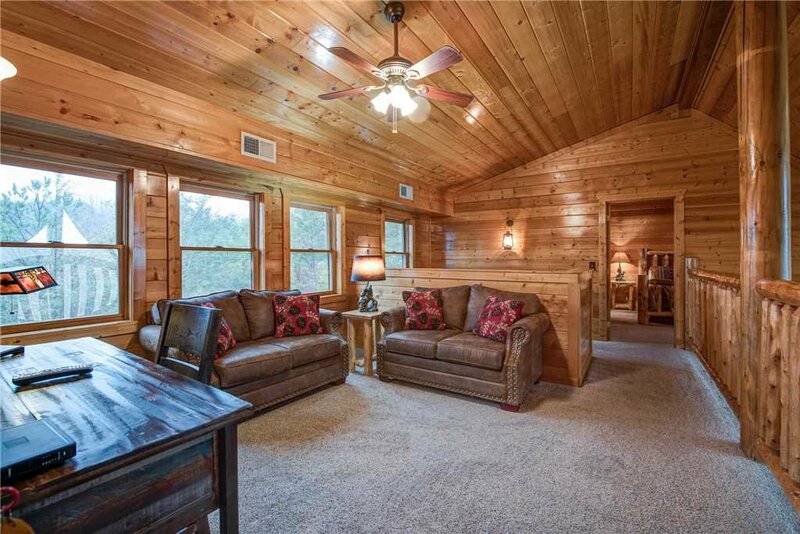 If you’re not convinced a log home in the Great Smoky Mountains can be luxurious, that’s because you’ve never been to Dreamscapes. 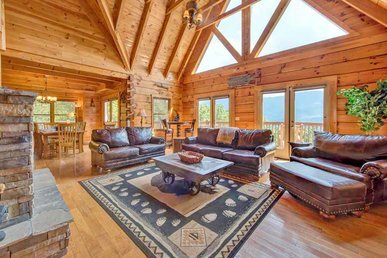 This five-bedroom, five and a half-bath retreat boasts an outdoor hot tub, an indoor jetted tub, a home theater, a pool table, and two spacious decks among its amenities—as well as spectacular views from just about every room. 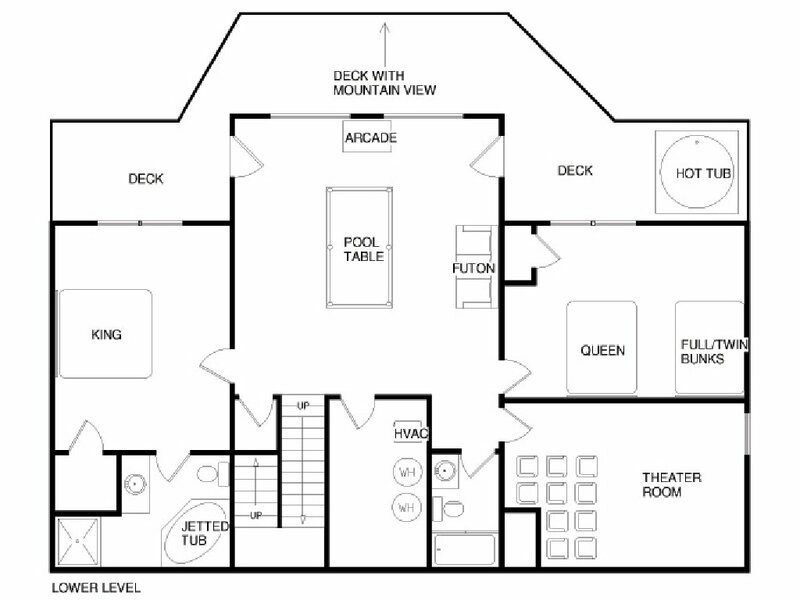 Let’s start our tour of the 3,715-square-foot home on the first of its three floors. 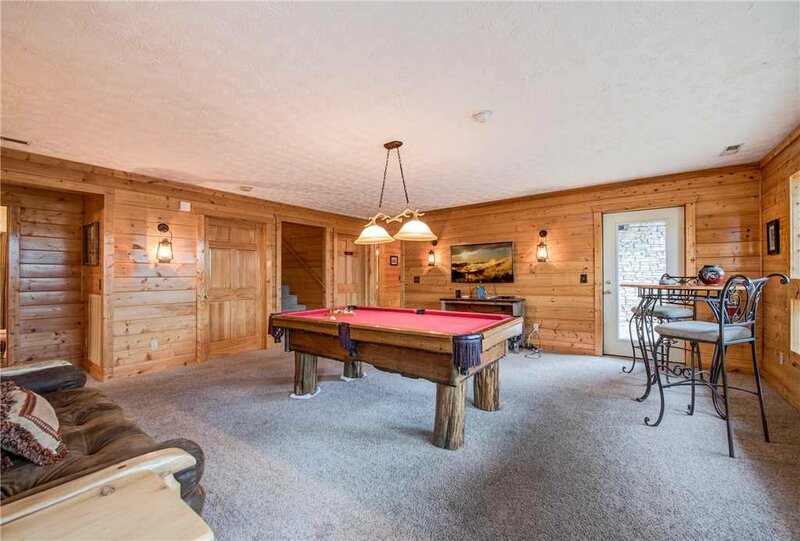 Here’s where you’ll find the game room, with a full-size billiard table, a sixty-game classic arcade table, and a 50” flat-panel TV. 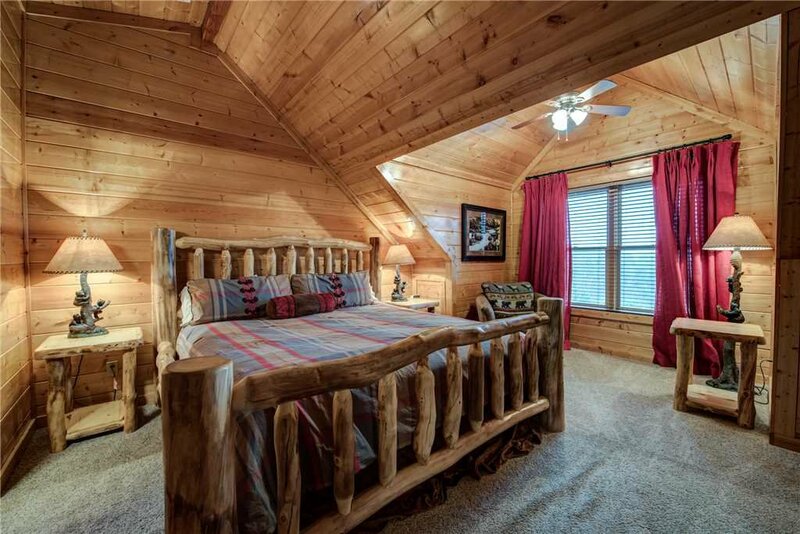 The leather futon opens into a bed for two—if anyone in your party is a video-game fanatic, they may want to make this their bedroom! 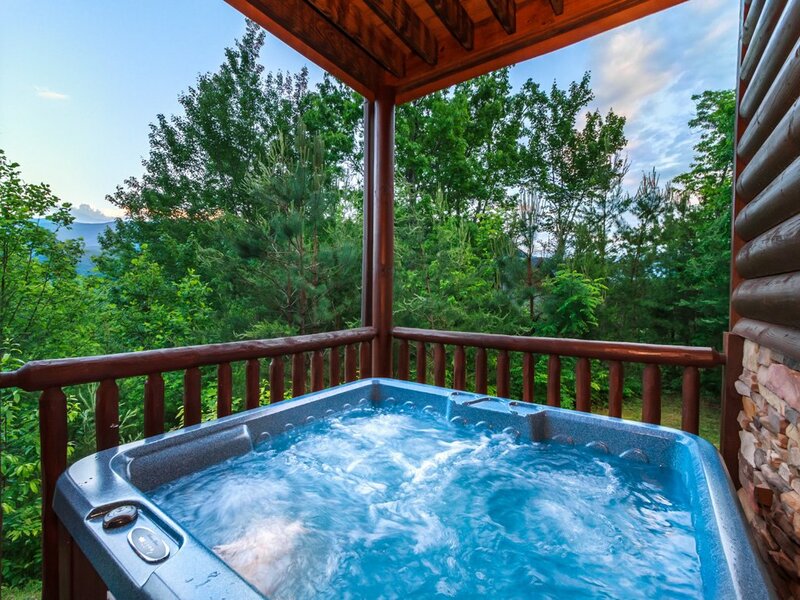 Should the competition get too fierce, step out onto the deck and unwind in the hot tub. 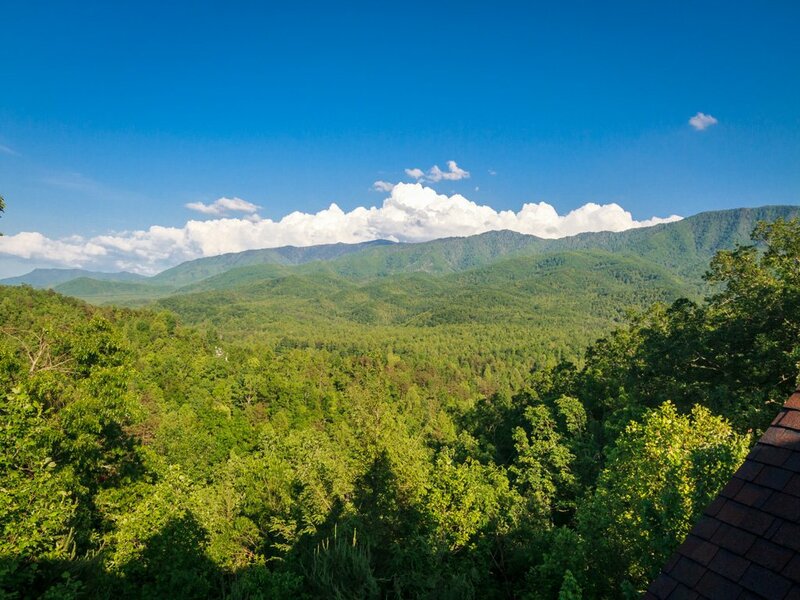 As if the jets of steamy water weren’t rejuvenating enough, you can gaze out at the lush woodlands and the mountains as you soak—sheer bliss! 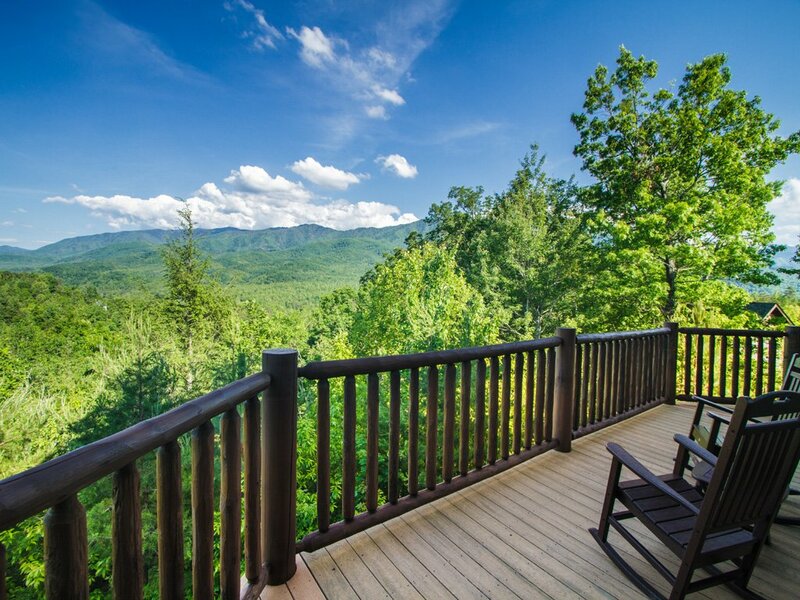 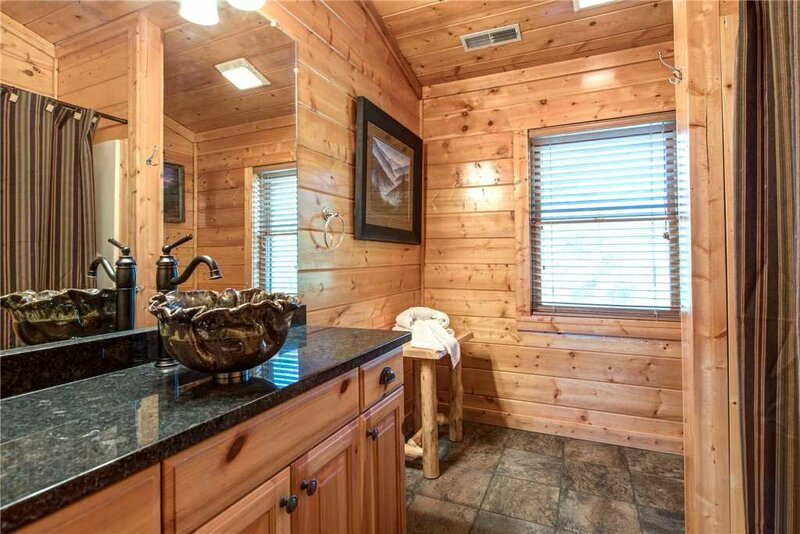 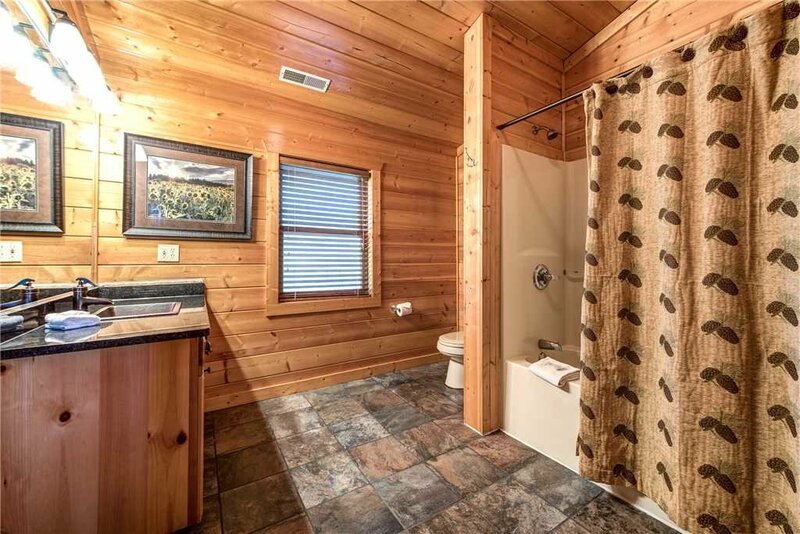 Once you finally force yourself to leave the tub, you can maintain the laid-back vibe by kicking back on one of the deck rocking chairs and listening to the mountain breeze rustle through the trees. 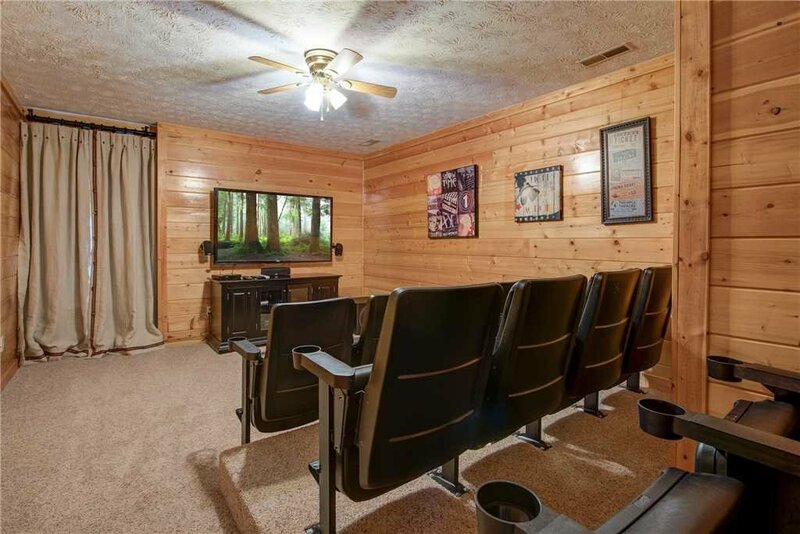 Also on the downstairs level is the home theater. 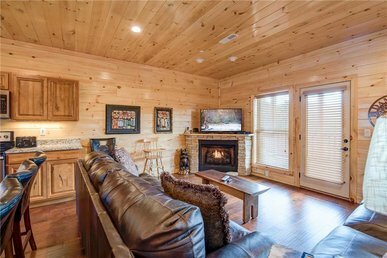 As well as a 65” viewing screen a Blu-ray player, and a sound bar, it offers genuine theater seating, complete with built-in cup holders. 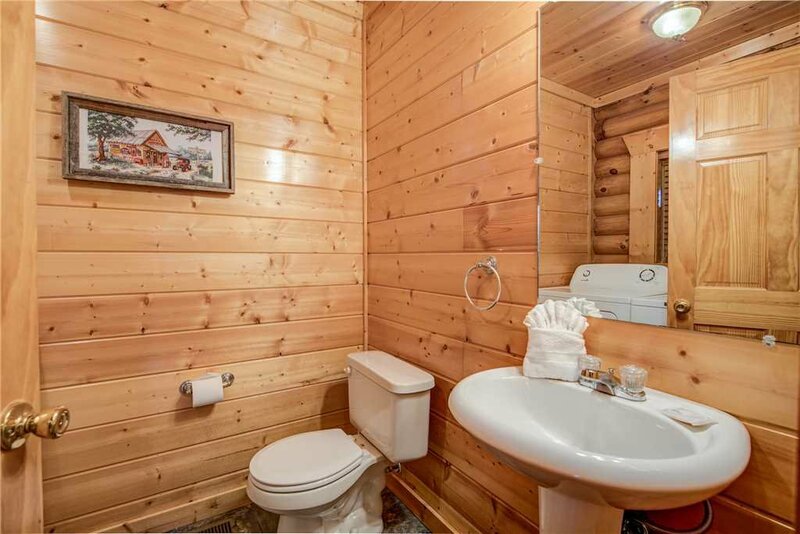 Go ahead, make it a double feature! 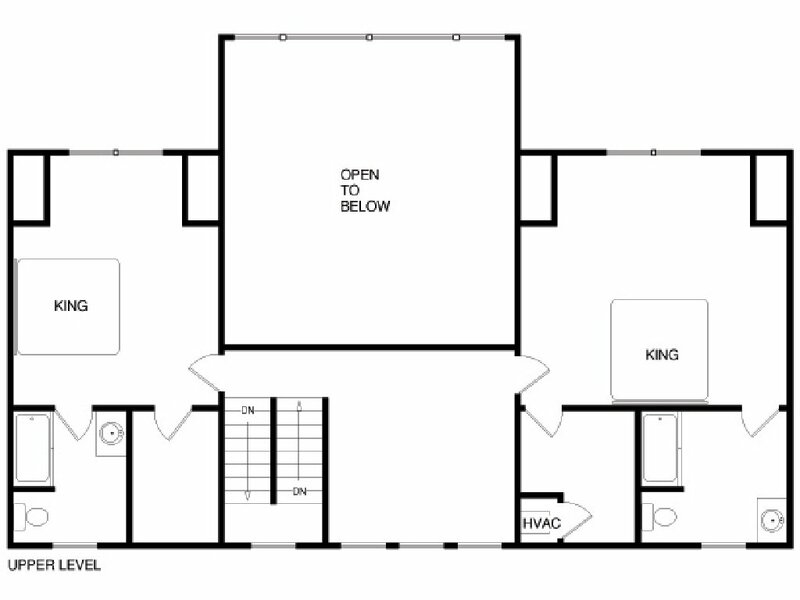 Two of the five bedrooms are on this floor as well. 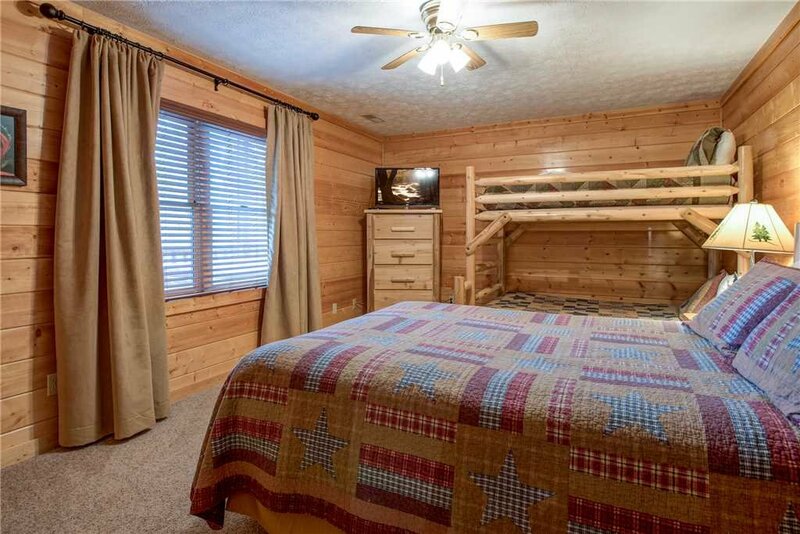 One includes a queen-size bed and bunk beds with a full bed on the bottom and a twin on top. 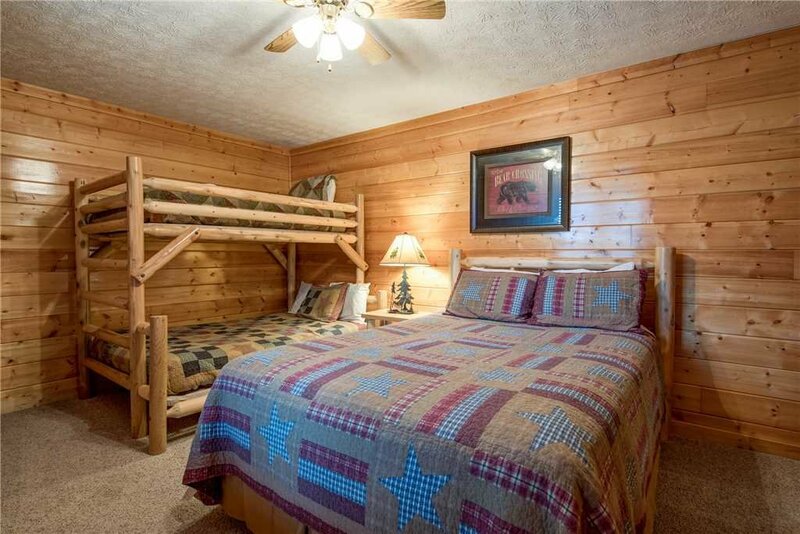 If there’s a family with youngsters staying with you, this room will suit them to a T. Or the kids might want to commandeer this room for themselves—every night will be a slumber party! 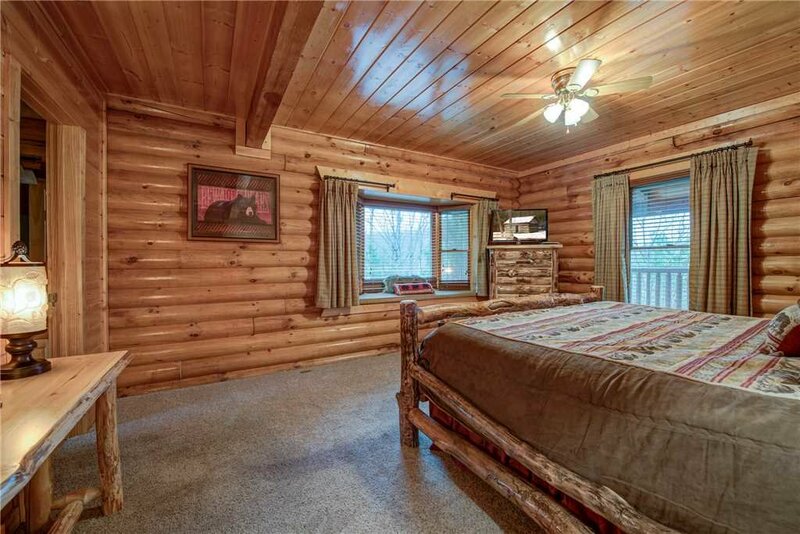 Like all the other bedrooms, this one includes a 32” flat-panel TV. 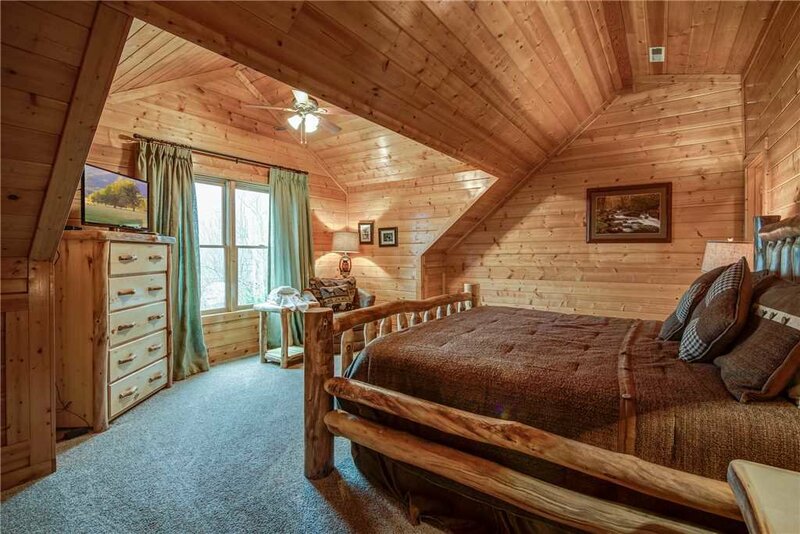 The other downstairs bedroom could be considered the master suite. 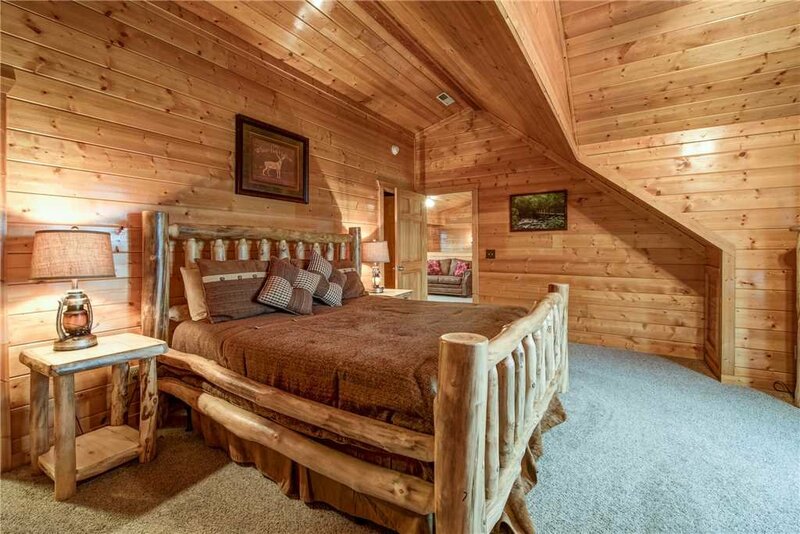 Then again, the bedrooms on the floors above could be considered master suites too: They all have a lofty king-size bed and a private bathroom. 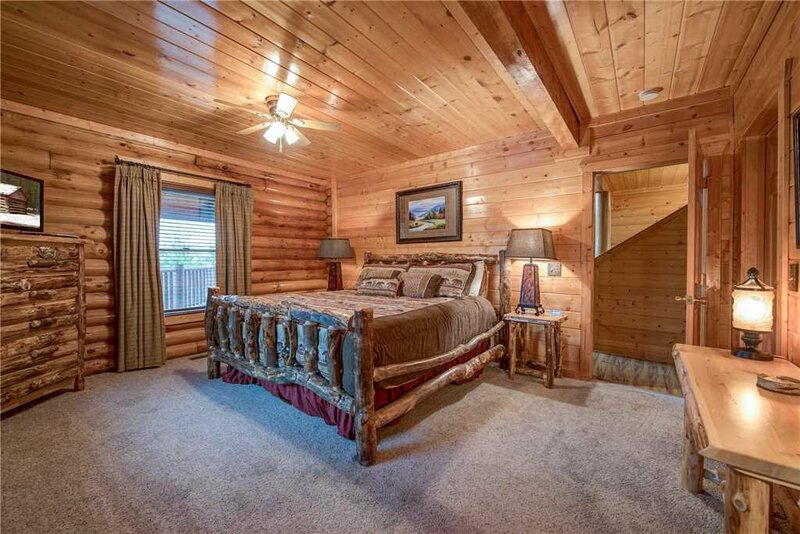 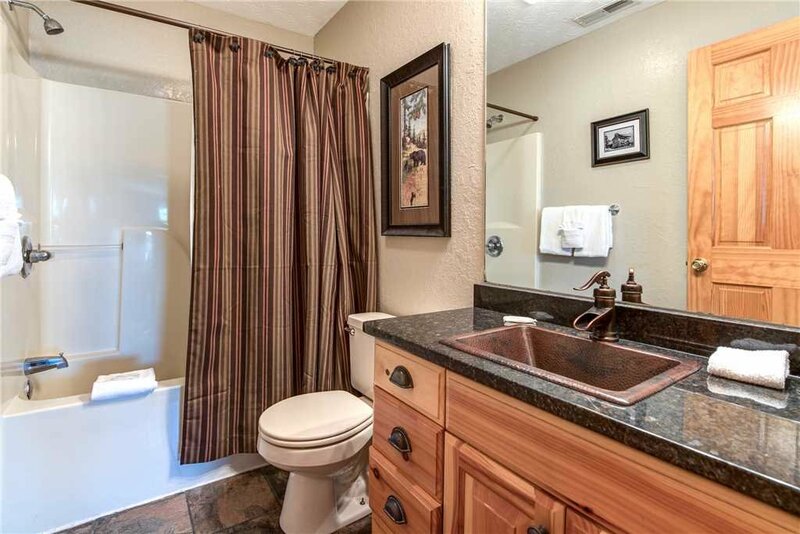 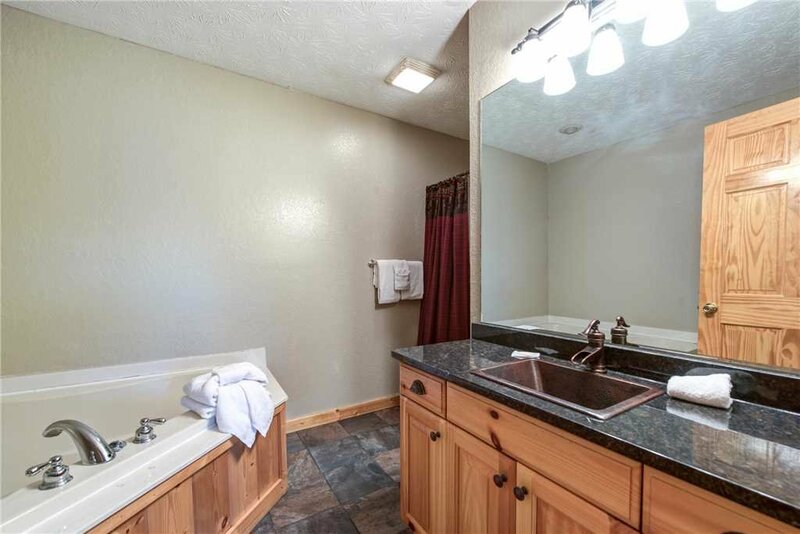 This bedroom, however, has a jetted tub in its bathroom, perfect for indulging in some “me” time. 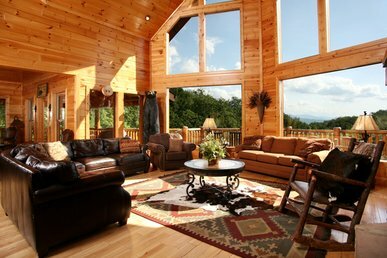 The floor above features another master bedroom, just off the great room—and it’s a great room that truly deserves the name. 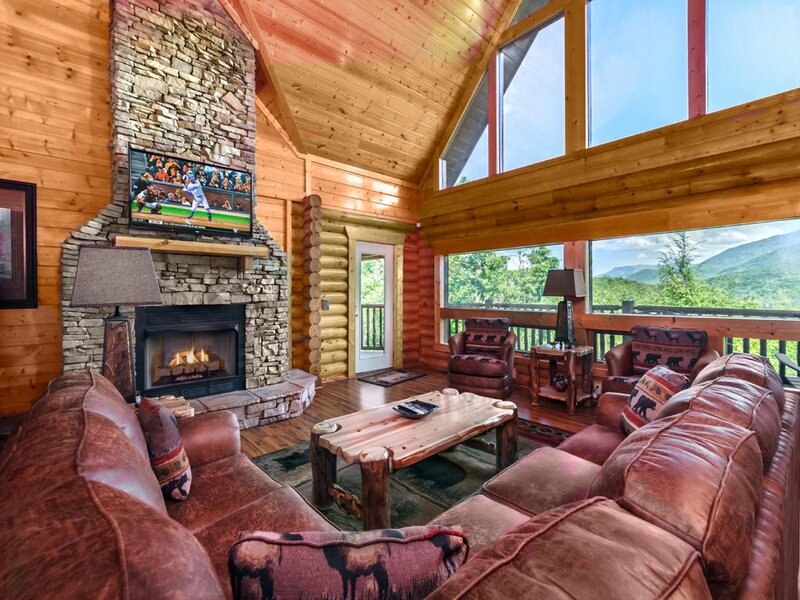 A double-height vaulted ceiling, a wall of windows that offer a superlative view of the mountains and woodlands, plenty of supple leather seating (including a sofa bed that can sleep two), a stone-surround gas fireplace, a 50” flat-panel TV with Blu-ray player: It’s an irresistible space for hanging out with the gang or relaxing on your own. 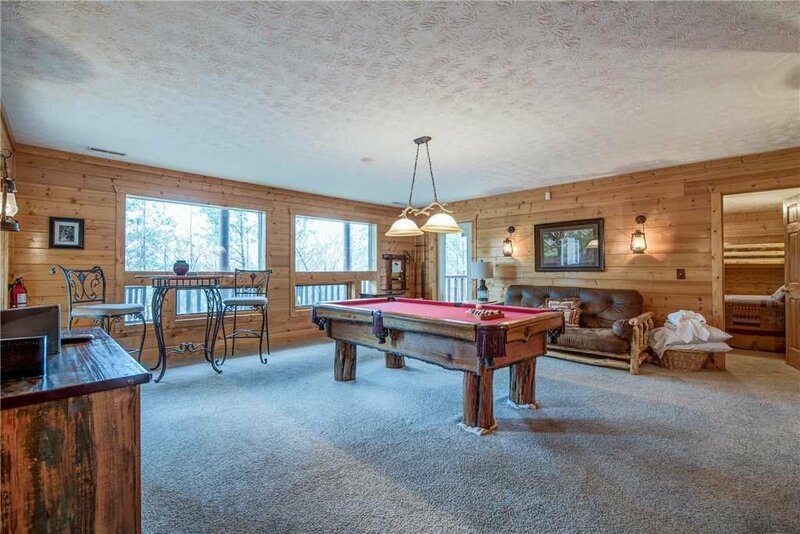 Adjacent to the great room is the dining area, with a large table that comfortably seats ten (no bumping elbows as you eat!) 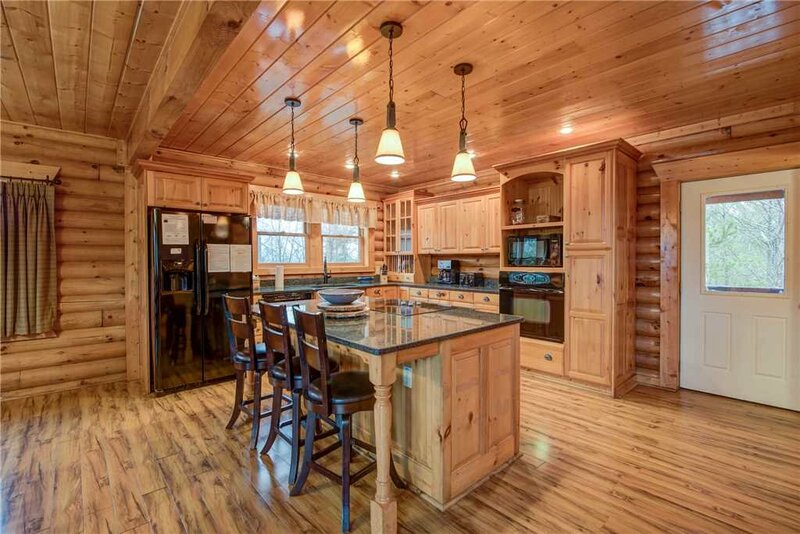 plus room for several more at the breakfast bar/kitchen island. 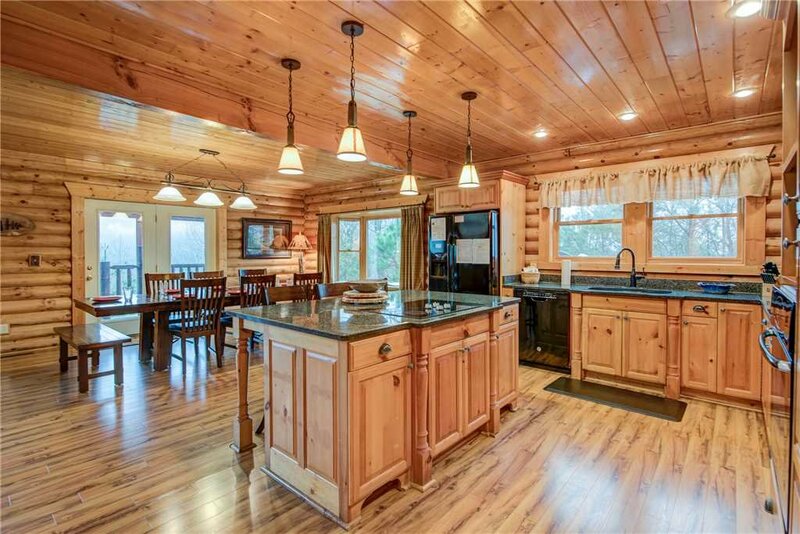 When you’re not eating at the breakfast bar, you can sit there and keep the chef company—or even better, lend a hand!—at the open, fully equipped kitchen. 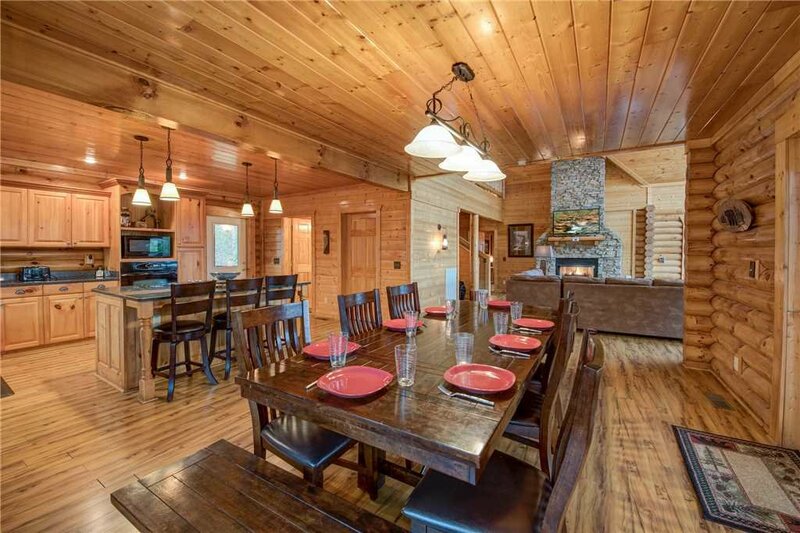 Whether you’re planning to host a multi-course feast or simply brew coffee in the morning and mix margaritas at night, you’ll find all the appliances, cookware, and tableware you could possibly need. 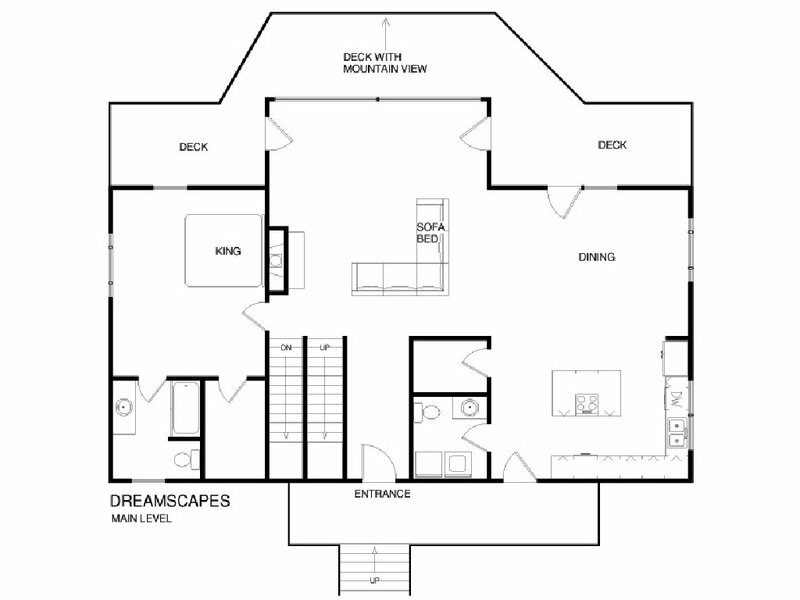 The remaining two bedrooms are on the top floor, as is a sitting room. 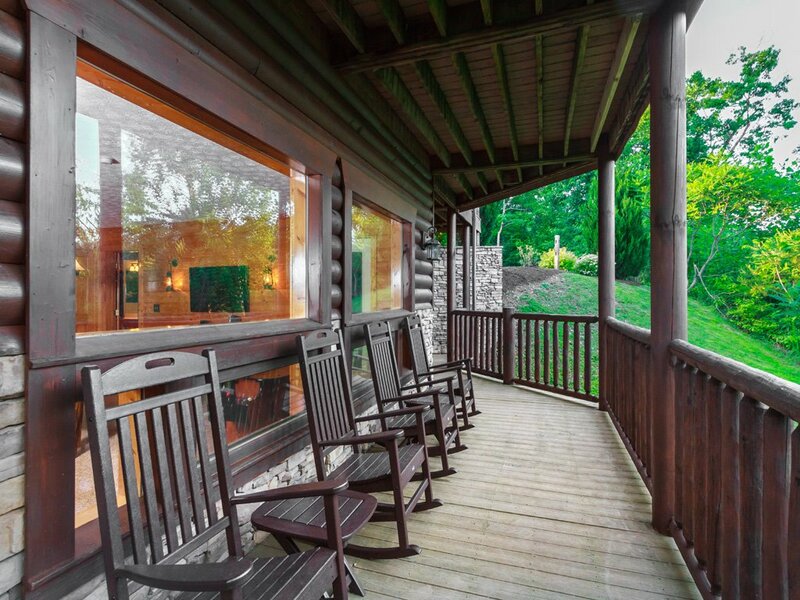 If you need to catch up on work or emails, you’ll appreciate the desk (and of course, Dreamscapes’ free WiFi); if you’re looking for a quiet place to read or have a private chat, you’ll find the two leather settees ideal. 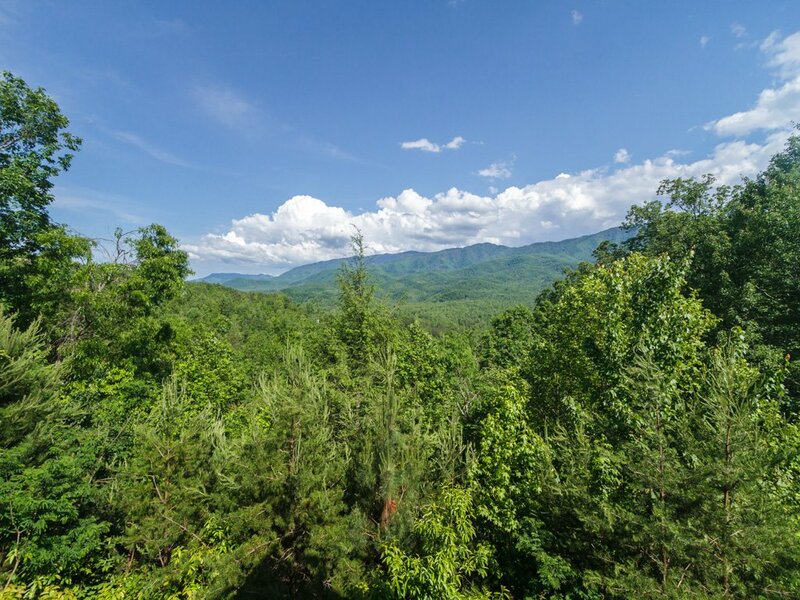 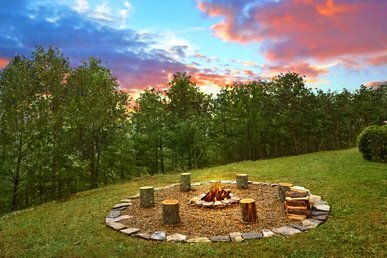 Also ideal is Dreamscapes’ setting: wonderfully peaceful and private, yet just a five-minute drive from Bent Creek Golf Course and also close to the Great Smoky Mountains National Park and the attractions of both downtown Gatlinburg and Pigeon Forge. 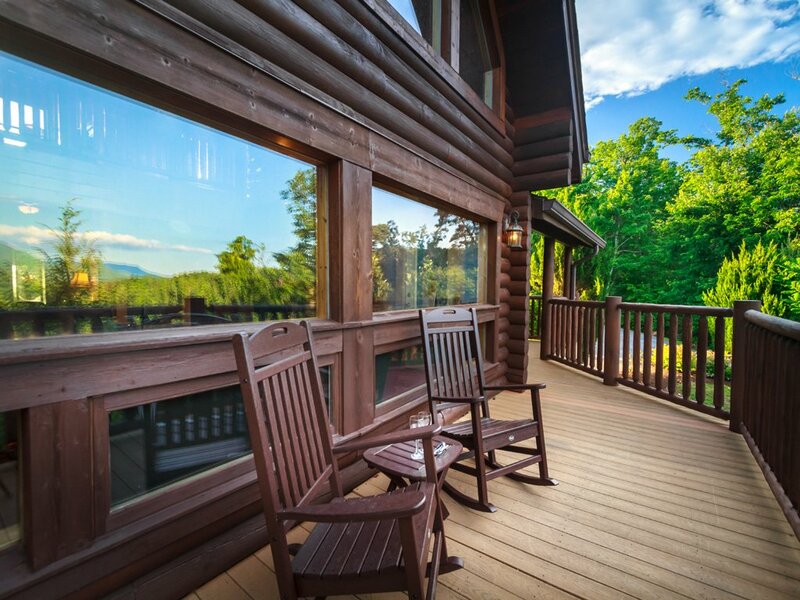 It might be corny to say that Dreamscapes is a dream getaway… but it happens to be true! 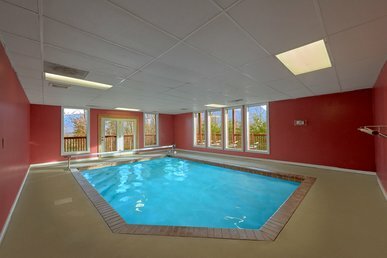 So make your dream vacation a reality, and book your stay today.